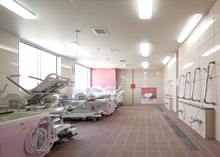 Since our hospital is a “treatment and recuperation type” hospital where patients can continue to be admitted to those who receive treatment in acute phase hospitalization and require subsequent hospitalization and treatment into the chronic phase. There is no limit to the number of days of hospitalization, so patients can rest at ease and engage in long-term recuperation as long as they continue to require treatment. 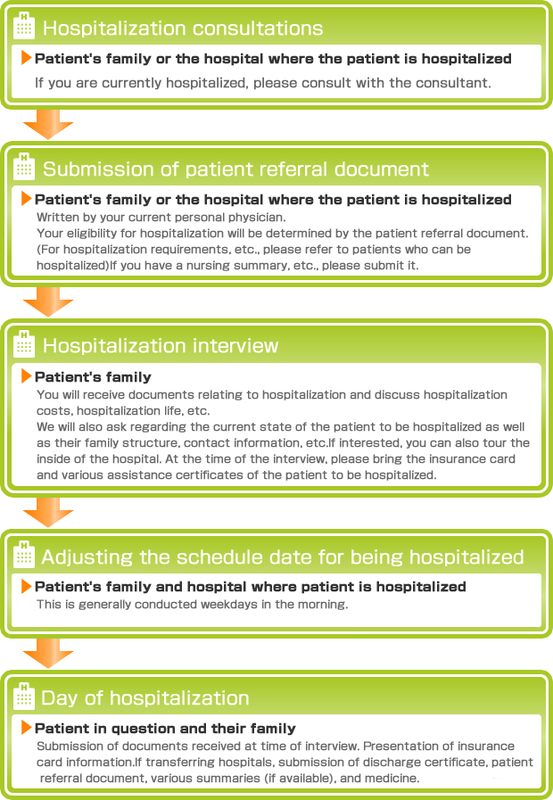 Furthermore, the hospitalization uses health insurance and not nursing insurance, so there is no need to receive nursing certification during hospitalization. In some cases you can be hospitalized even if you do not fall into the above categories so please consult with a consultation staff. Please bring 5 sets of pajamas, underwear, and socks for each season. ※Please ask regarding laundry fees and other detailed charges. Please follow the instructions of charge physicians and nurses regarding matters during treatment (including meals). Patients are asked to manage their own personal effects and not to bring valuables. 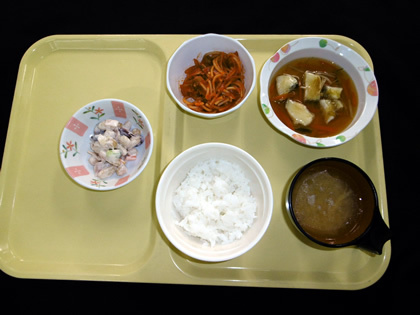 Due to hygiene and patient aspiration issues, bringing in food as a general rule is prohibited. Due to hygiene issues, please refrain from bringing in fresh flowers or potted plants. Please understand that you cannot bring diapers. 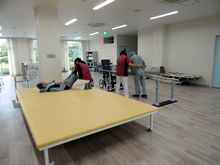 Physical therapists, occupational therapists, and speech and language therapists will conduct gentle rehabilitation to fit the patient’s medical condition and physical capabilities. A speech and language therapist will conduct swallowing practice so that patients “can eat through their mouths even just for the enjoyment”. These will be conducted as appropriate considering the patient’s condition. The entire body is placed in warm water. 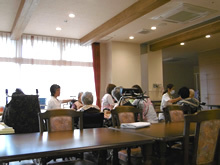 Patients can gather in the cafeteria to enjoy meals together. Eating assistance will be provided depending on their condition. 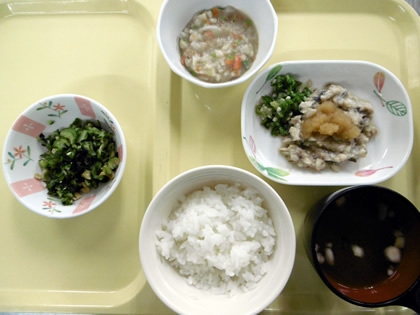 At this hospital, meals are provided in a form that is appropriate for each patient. 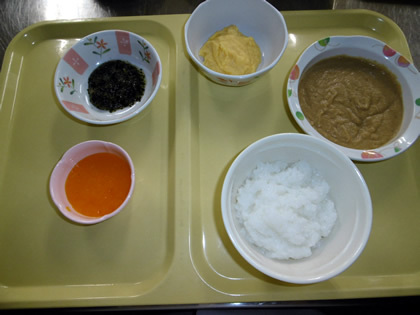 Even patients who were only able to eat food in paste form at other hospitals and institutions have become able to eat solid food here due to the evaluation of their swallowing function. 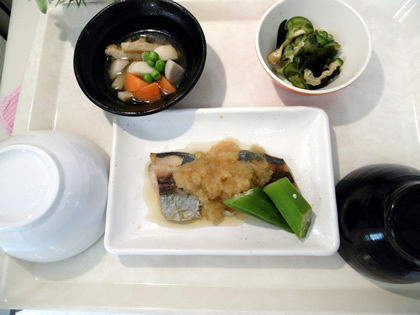 To do this, first the speech and language therapist evaluates the patient’s swallowing condition, determines what level of nutrition they require, and thinks of meal contents for the patient together with staff of other professions. A nutritionist obtains information from physicians, nurses, caregivers, rehabilitation staff, pharmacists, care managers, etc. before judging the patient’s risks of poor nutrition, then evaluates their nutritional condition and devises an individualized alimentation method for them. 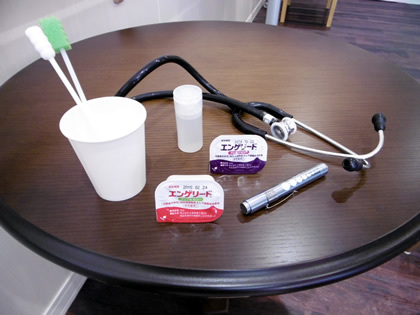 Meal contents can be adjusted to fit the swallowing functions of individual patients. Meal time will continue to be something to look forward to with meals that take individual nutritional conditions into account. Our goal is to provide this enjoyment through our meals. There are also many patients who cannot engage directly in conversation, so information from their families is extremely important. 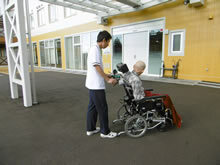 Please tell us about the patient’s current condition, whether they have likes and dislikes, or any other information. We also provide patients with the will to eat meals together with high-calorie transfusions (IVH) and tube feeding (gastric fistula).